For those who are in love with the beauty of nature! Welcome to another post of trulyvietnam.com! Today we are going to introduce you the list of 10+ incredible grottoes in Halong you need to visit at least once. Bet that you will never regret it! Get a comfortable seat and some yummy snacks before reading this amazing list. We can say that Sung Sot grotto is the most famous grotto of all in Halong Bay. 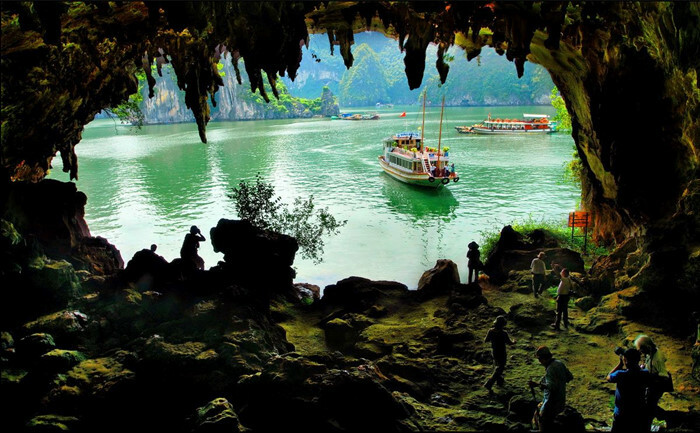 This amazing grotto belongs to Bo Hon island and it is located at the center of Halong Wonders. In order to visit Sung Sot grotto, you need to walk on a lot of stone stairs and cliff edges. Sung Sot cave is divided into 2 chambers and each chamber has its own charisma. In the first chamber, a majestic ceiling cover by stalactites is the queen of all scenery. The lighting system makes the ceiling even more beautiful in vintage style. There is a small road that connects the first area with the second area. The second chamber is a massive space that can contain more than 1000 people at a time. In the lowest point of Sung Sot Cave, there is a freshwater pond which provides water for the flora surrounding. Not crowded and touristic much as Sung Sot Cave but Thien Canh Son grotto still steals the show with its own beauty. Thien Canh Son Cave is one of the most beautiful caves in Bai Tu Long Bay. The cave is covered under a forest and cliff edge, that’s why it’s not easy to find this amazing cave at the beginning. Thien Canh Son grotto has 3 chambers and each one has its own impression. When you first get into the first chamber, you will be shocked by the amount of stalactites and stalagmites of the cave. They are all formed for million years ago and still grabs the attention of everyone nowadays. These stalactites and stalagmites have the look of many things: a baby elephant, a lotus, etc. “The magical ceiling” is the most breathtaking scenery that tourist will never forget. Seems like The Creator created a lot of images and unique shapes on the ceiling of the Thien Canh Son cave. The easiest images that you can see from the first look are flowers, seals and stone elephants. 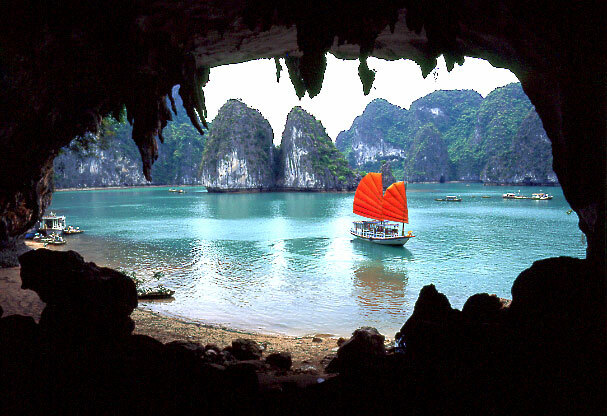 Dau Go Island (Wooden Head Island) is among the most famous tourist attractions in Halong Bay. Inside Dau Go Island, tourists will find Dau Go Grotto a very interesting cave. There is a massive system of stalagmites and stalactites resembling stony waterfalls would make anyone feel like being one with the nature. The cave has three main compartments. The first area has a curved shape which is filled up by natural light. The celling of this area is a giant oil painting describing primitive landscapes with rows of stalagmites and stalactites changing their color upon the intensity and angle of the light. Next, tourists will get to the second part. It is a little bit lack of light, but it has a more intriguing ambiance of fuzzy picture created by the combination of light and stalactites that stimulate your curiosity. The adventure continues with a sudden discovery of the last massive. Here, there is a sacred fairy well that is said to be used by beautiful fairies descending from the heavenly kingdom. Dau Go grotto is proudly listed in the world famous tourism book Merveille de Monde published in France in 1938, which presents the most beautiful and worth visiting tourist attractions in the world. Thien Cung grotto or the Grotto of Heavenly Palace is on the same island with Dau Go grotto. While Dau Go grotto boasts the mossy beauty and glorious history, Thien Cung grotto makes the visitors the impression of being in a heavenly world. That’s why we call Thiên Cung grotto a heavenly stunning destination. To complete a tour of Thien Cung Grotto, the visitors are to pass a narrow path with stunning stalactites that look like swaying curtains in a theater. Trinh Nu grotto or Virgin Grotto belongs to the island range of Bo Hon 15 km south of Bai Chay Beach, the center beach of Halong city. Entering Trinh Nu Grotto, you will find in the middle of the grotto a stone shaping a lying-girl with her long hair hanging down, looking to the sea with the eyes full of vain hope. To young couples, it is the symbol of truly love, a romantic place for taking oath of love. The legend said that once upon a time, there was a beautiful fisherman’s daughter, whose family was so poor that it was in the service of the rich administrator of the fishing zone. He forced the father to give him the girl as a concubine. However, she refused as she already had a lover. The administrator, angered by her refusal, exiled her to a wild island until hunger and exhaustion. And then, she turned to stone. The image of the girl painfully waited in vain for her fiance turns the cave into a sacred place for those who are in love. Luon grotto, the familiar destinations for most of kayaking tours on Halong Bay. It is famous for its green complex of in-mountain waters and islands. Situated on Bo Hon Island, 14 km south of Bai Chay Beach is the Luon Grotto. In front of the grotto is Con Rua Islet (Turtle islet), and the Sky Gate is on the right. Passing through the pretty entrance, tourists will reach a lake formed by an enclosed group of lime-stone mountains. The lake inside seems like a stadium surrounded by high podium. Size of the lake is nearly 1 square kilometers. Especially, it’s highlighted with pristine setting of ferns, orchids and wild golden monkeys. The perfect combination of lime-stone mountains and jade-green sea makes Luon Grotto a unique site to visit on Halong bay. Bo Nau Grotto (Pelican Grotto) is located on the southwestern Halong Bay. It’s about 13 kilometers far from Bai Chay Tourist Wharf and 2-3 kilometers to the southeast of Trong Mai Islet. This grotto covers an area about 200 m². Its floor is not deep but wide and flat. The name of the grotto was born due to the fact that pelicans often take shelter here. Meanwhile Dau Go Grotto lies completely inside the island; Bo Nau grotto opens its mouth at the side of the island. Right on the entrance is three blocks of stone. They look like a sculpture about three fairies playing chess. The space inside covers an area of 200 square meters. From the cave, tourists will get a unique view of Halong bay that seems like standing in the monster’s mouth with sharp teeth and seeing magnificent scenery outside. Ok everyone, this is the end of part I for the list 10+ incredible grottoes in Halong. The list is going to be a litle bit long so we will update part 2 tomorrow. We hope you enjoy this list. Leave a comment below and follow our blog for the latest news about Halong! In order to book other amazing tours in Vietnam please visit our website at trulyvietnamtour.com! Hey there, Part II of this amazing list has been publicized already! You can check it by clicking HERE!